Billy Miner robbed stagecoaches. Not that he was mean about it. His regular greeting, "Put your hands up and no one gets hurt", earned him the nickname 'The Gentleman Bandit'. But, even gentlemen can be caught. When Billy got out of a long stretch in San Quentin, times had changed. Stagecoaches were almost gone, replaced by trains. Billy realized that trains were the way of the future. "Have to move with the times, I guess", he concluded. "And, speaking of moving, maybe I'll just wander up and see how things are in Canada. Get away from those Pinkertons." Billy moved north. Eventually he settled down near Kamloops and, as Mr. George Edwards, was soon a respected member of society. But, he kept thinking about those trains. On May 8, 1906, Billy, Louis Calhoun, and Shorty Dunn robbed the CPR train 16 miles east of Kamloops. It was the second train robbery in Canada. (The first was committed by Billy at the coast in 1903.) The 1906 robbery netted them $l5.00 and a package of liver pills. They'd been hoping for more. But, if Billy was popular before, robbing the CPR made him a Western hero. Ranchers and settlers alike believed that the CPR was bent on charging the highest prices to its customers. Billy Miner, who carried out the only two train robberies in Canada, may not have been successful, but Westerners thought he had the right idea. 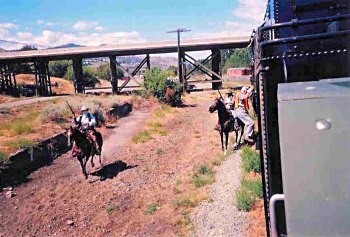 So, when Engine 2141 commenced rail tour operations in Kamloops in 2002, it seemed only natural that the Billy Miner Gang form part of the experience. It's certainly local history. And, it's history in action. The train trip is almost over when gunshots ring out, horses gallop across the rail; the engineer is motioned down from his cab and made to hold the horses, leading to whispers among the passengers of his being in cahoots with the robbers. The gang boards the train demanding gold, and despite the crew's courageous refusal to tell, gold is found. Billy Miner himself then takes the megaphone and gives a brief history of railroading and ranching in the Canadian West, and of his own life on the run. He and the gang then mount up and, in an admirable display of horsemanship, ride alongside the train giving high fives to the fascinated passengers. After the robbery the gang trots back to the station where the formerly fearsome bandits encourage children to pat the horses, sit on them and get to know the patient, powerful animals. Both horses and children love it. For Larry Foss, aka Billy Miner, it's a way of preserving and supporting our Western heritage. "Education through entertainment" is his motto. "Bring people in, make them part of the action. Keep Canadian history alive in people's imaginations." From the happy faces surrounding the horses, it's effective. Larry, horseman, actor, writer and rancher, is as at home on a stage set as on a saddle. He has documentaries, and TV series both with the CBC and in the U.S. as well as movies to his credit. Larry believes in making Western history exciting, interesting and available. "This was a unique culture and should be promoted", he says. Promote it he does. He focuses on local lore and uses local actors many of them retired cowboys. "It's a demanding job. As well as being expert riders they have to be able to handle guns both on and off horses and to follow a script. " Even the horses are auditioned. "It's not for every horse." Larry points out. Of the seventy horses, which tried out for the 2002 re-enactment, only fifteen were able to do the job. Horses, which get the parts, must be both agile and calm. They can't be frightened by the blanks being fired nor by the noisy, hissing monster they race beside. During auditions the train is run back and forth past the horses to see how they react. The horses have to put on speed during the robbery then gentle down enough for children to pat them a few minutes later. These are multi-talented horses, Larry emphasizes. Some are naturals. Old Jocko, a former ranch horse, came out of retirement and is spending his golden years as an equine actor. Train robbery horses are being groomed for TV and movie parts so they rotate. They and their riders rehearse like any other actors. Eight people take the parts of Shorty Dunn and Louis Calhoun, though Ed Sawatsky usually plays Louis. Back on the station platform is a conveyance, which would have gladdened the heart of Billy Miner, a stagecoach. It's one of only ten working stagecoaches in B.C., and it, too, is under the supervision of Larry Foss. For a small fee passengers of steam train 2141 can experience a mode of travel, which preceded rail. The coach itself is a replica built fourteen years ago, modelled on the pre-1872 coaches from California. At one time twenty-four stagecoaches, using 2500 horses served the B.C. interior. Today travellers can view Riverside and Pioneer Parks or downtown Kamloops behind two handsome Belgian Percherons.